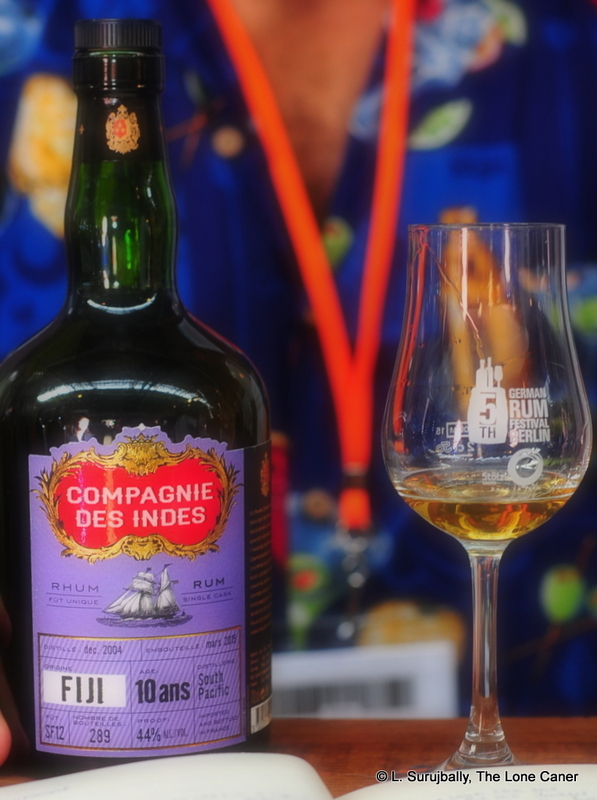 Although the Compagnie des Indes has a few very well received multi-island blends like the Tricorne, Boulet de Canon, Caraibes and the Domindad, my appreciation of their work is so far given more to individual islands’ or countries’ rums. There’s something about their specificity that makes the land of origin snap clearly into focus in a way a blend doesn’t (and doesn’t try to, really). That’s not a criticism by any means, just a direction in which my preferences bend, at least for now. After having gone through a few Fijian rums recently, I finally arrived at this one, which could not beat out the hauntingly magnificent TCRL 2009 8 Year Old, but which came a very close second and was in every way a very good rum. 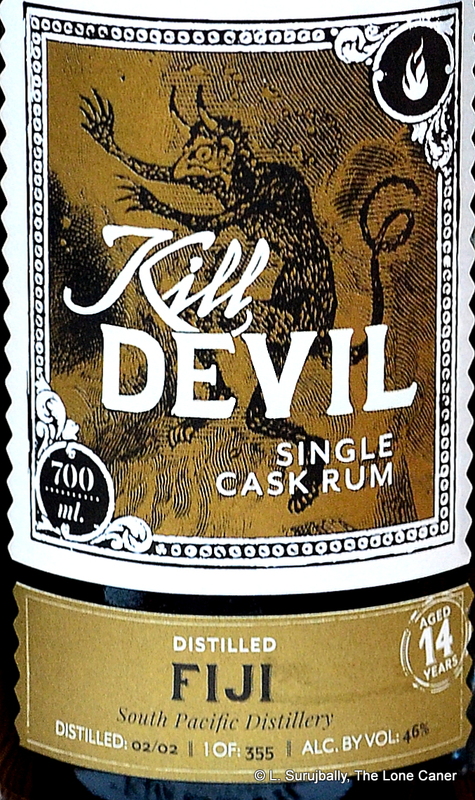 It was also from South Pacific Distilleries (the only distillery on Fiji and a subsidiary of the Asutralian Foster’s group) with a 244-bottle outturn from one cask, ¾ continentally aged, a blend of pot and column still, bottled at a hefty, snarling 66.8% – it is of course one of those rums issued as a one-off series for Denmark in a pre-cask-strength CdI rumiverse (the cask strength editions from CdI started to appear around Europe in 2017 as far as I can tell, which disappointed a lot of Danes who enjoyed the bragging rights they’d held on to up to that point). It was obvious after one tiny sniff, that not one percentage point of all that proofage was wasted and it was all hanging out there: approaching with caution was therefore recommended. I felt like I was inhaling a genetically enhanced rum worked over by a team of uber-geek scientists working in a buried government lab somewhere, who had evidently seen King Kong one too many times. I mean, okay, it wasn’t on par with the Marienburg 90 or the Sunset Very Strong, but it was hot. Very hot. And also creamy, deeper than expected, even at that strength. Not quite thin or evisceratingly sharp like oh, the Neisson L’Espirit 70°, and there was little of the expected glue, brine and dancing acetones (which makes me suspect it’s a column still rum, to be confirmed) – and man, the clear, herbal crispness of an agricole was so evident I would not have been surprised to find out that cane juice was the source (all research points to molasses, however). After my eyes stopped swimming, I jotted down further notes of citrus, peaches, tart unsweetened fresh yoghurt, and it was of interest that overall (at least on the nose), that creaminess and tartness and citrus acidity blended together quite well. Things got interesting on the palate: again it was hot enough to take some time getting used to, and it opened with a pronounced nuttiness, sour cream, nutmeg and ginger. Over half an hour or so other flavours presented themselves: fleshy fruits, (dark cherries, peaches, apricots) and further musky spiciness of cloves, tumeric and cinnamon. Molasses, toffee, butterscotch. Plus wax, sawdust and pencil shavings, bitter chocolate and oak….wow. After all that, I was impressed: there was quite a lot of rabbit squirming around in this rum’s jock, in spite of the strength and heat. Even the finish was interesting: strikingly different from the Duncan Taylor or the Rum Cask Fijians (both of which were clearer, crisper, sharper) the CdI 11 YO showcased a sort of slow-burning languor – mostly of fleshy fruits, apples, some citrus, candied oranges – which took time to develop and ended with the same soft undertone of molasses and caramel as had characterized the palate. Let’s sum this up as best we can. I think the sharper tannins kind of detracted (just a little) because the softer notes were not enough to balance them off and produce a pleasing combination. Even so, such a discombobulation made for an element of off-the-wall that was actually quite enjoyable because you keep going “huh?” and trying it some more to see where on earth the thing is going. So it succeeded on its own terms, and was quite individual on that level. Overall though, it seems to me that no one rum I’ve tried from South Pacific Distillers has a lock on the country or distiller’s profile that characterizes either beyond any shadow of a doubt. In point of fact, those which I’ve tried to date are each different from the other, in ways both big and small, and that makes it difficult to point to any of them and say “Yeah, that’s a real Fijian rum” — maybe I’ll have to find a few Bounty rums for that. Still, for the moment, let me sum up this Fijian by stating that as long as you don’t mind getting a rum that wanders with furious velocity from the centre line to the verge and then into a wall, all with a near joyous abandon, a rum which has curious and slightly unbalanced tastes that somehow still work…well, this is definitely a rum to try. It’s a rum that grows on you with each sip, one that you could easily find yourself trying deceptively often, and then wondering confusedly, a few weeks or months down the road, why the hell bottle is empty already. 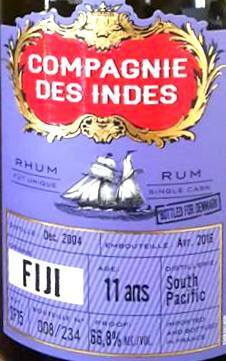 Rum Cask makes a slightly better Fijian rum, of the four I’ve tried. Rum Cask is another one of the smaller independent bottlers – out of western Germany in this instance, very close to the French border – who do the usual craft bottling thing. They act as both distributors of whisky and rum, and at some point they fell to dabbling in their own marques, issuing cask strength rums from Belize, Guadeloupe, Jamaica, Cuba Grenada, and more, including Fiji, which may be something of an afterthought. In what is probably a coincidence, they issued a ten year old rum from South Pacific Distilleries, and it was also made in 2003, and bottled in 2013, just like Duncan Taylor (or they used the same broker, or something). However similar the provenance, in this instance I felt that while they didn’t succeed in making a rum junkie’s must-have, they did succeed in raising the bar…just a bit. Take for example the nose, which so disappointed me on the Duncan Taylor from last week. That one was 54.8%…this one dialled things up to a filthy-gorgeous growl of 62.9% and its intensity was right there from the get-go. Much of the same kerosene, fusel oil, wax, and turpentine jammed my sensory apparatus – the rum would cure the clogged nose of a sinus infection with no problems – but here there were also nuts, honey, vanilla, some burnt sugar, and switching back and forth between it and the DT (and the clairins), it suggested an overall better balance. Unfortunately, it also required some taming. Since I have no particular issues with cask strength rums (how the worm has turned from the days when I despised anything stronger than 40%, right?) the ABV was not a factor: it was its unrefined character. The palate was raw and sharp enough to shave with, and exhibited an unrestrained force that seemed to want to scratch your face off. So while I spread the tasting over several hours and wrote about sensed tastes of salt beef in vinegar, cereal, brine, olives, some more vanillas and caramel, nuts and honey, plus a whiff of citrus and fresh paint in hot sunlight — and lots of oak — the fact was that the marriage just wasn’t working as well as it might. Yes the finish was biblically epic, hot and long and lasting, shared more of the flavours of the palate (the citrus and wood really took over here) and made my eyes water and my breath come in gasps – but really, was that what it was all about? The grandiose finish of a taste experience that might have been better? The Fijian rums (those I’ve tried, at any rate) seem to have problems with the integration of their various components, and they need more work (and ageing) to be taken seriously by, and to find, a mass audience – this might be one of those rare occasions where less strength is called for, not more. So who is this particular rum for? It doesn’t really work as a sipping rum, and at its price point, would it be bought by a barman so as to make cool tiki drinks? Unless one is a cocktail fan, then, that doesn’t leave much, I’m afraid, unless you are, as one commentator remarked on the DT, a lover of whisky. In which case, by all means have at it. This rum is very much about opinion. Cornelius of BarrelProof liked both of these quite a bit (he was the kind source of my samples, big “thank you” to the man), so keep an eye out for his reviews. 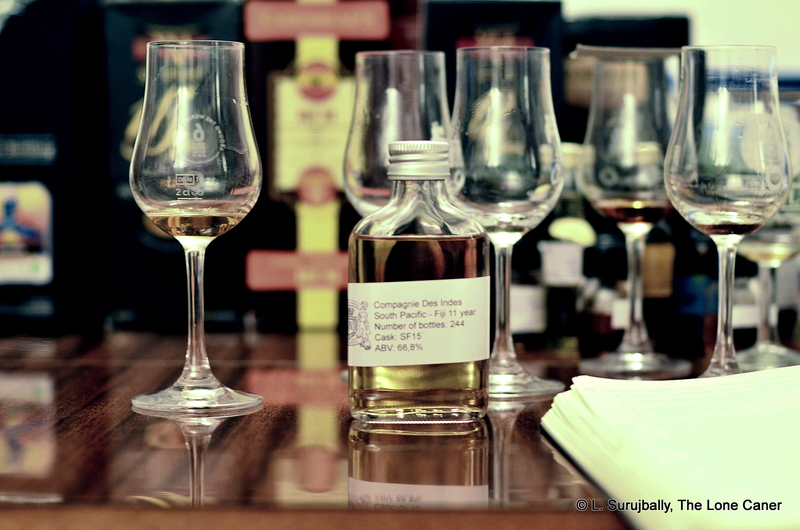 Comments on the Duncan Taylor Fijian rum suggested that the profile was quite Jamaican in nature, if not quite as good. The same applies here. Most Jamaican rum I’ve tried are bit more obviously from molasses, and I didn’t really get that impression from the Fijians. Actually, they remind me more of cachacas and perhaps the clairins. A well assembled rum made by someone who knows his business, yet, as with the BBR I tried some years ago, not entirely to my taste. Florent Beuchet, the man behind the independent bottler Compagnie des Indes, really likes to go off the beaten track in his search for proper casks of rum to release: either that or he has access to some broker or other with some cool geographically dispersed stocks. Think about the rums he has in his young portfolio so far – from Guyana, Cuba, Guadeloupe, Martinique, Panama, Jamaica, Trinidad, Belize and Barbados, all the old stalwarts. But show me another maker who in a single two year period can also claim to have added St. Lucia, Haiti, Fiji and Indonesia to the mix. St. Lucia alone should draw nods of approval. But Haiti? Fiji? Indonesia? Therefore, yes, I’m a little impressed, more than a bit intrigued, and follow his issues closely, though thus far I don’t have that many…yet. 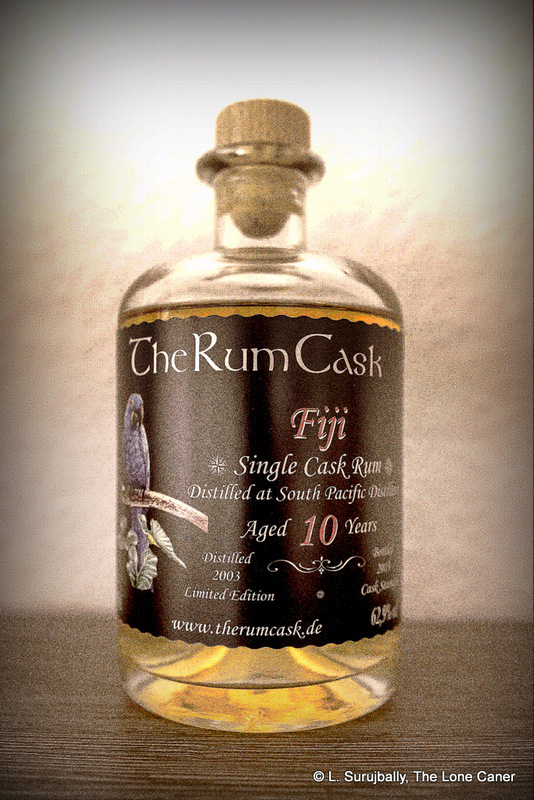 I was fortunate enough to try several samples of the Fijian 10 year old bottled at 44% in my ongoing effort to draw attention to obscure corners of the world where rums are made (but receive too little attention), and where unsung treasures may be found to the aspiring, perspiring rum collector. 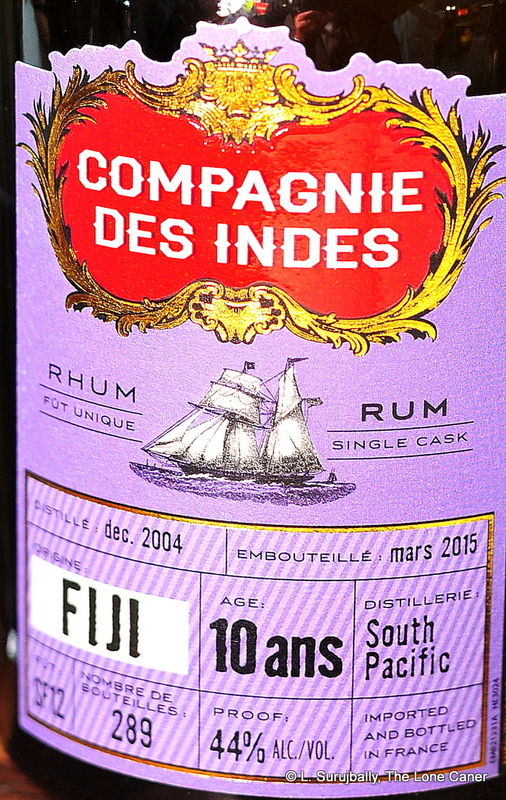 So, this one: it was one of two 2015 Fijian releases CdeI made (each from a separate barrel), and it’s from the South Pacific Distilleries distillery – Florent didn’t tell me, but come on, it’s right there on the label…and anyway, even if it wasn’t, how many other distilling ops are there on the small island? This in turn is controlled by the Carlton Brewery (Fiji) Ltd, and that itself has the parent company of the Australian group Foster’s. They make the popular Bounty rums (not the same as St. Lucia’s) and so far as I can tell, only BBR, Duncan Taylor and Cadenhead have released any bottlings from there. And full disclosure, I didn’t care much for the BBR Fiji 8 year old. Still, things started out okay: the yellow rum was spicy and dry to sniff, with sugar water and delicate floral scents. Watery is a good term for the sort of smells it exhibited – and by that I mean watermelon, juicy white pears, diluted syrup from a can of mixed fruit, grass after a rain. This was all to the good. What happened after a while was that waxy notes crept in, black/red olives in too-sour brine, and that palled my enjoyment somewhat. The taste of this light bodied, column-still-made rum was the best thing about it. Hot, freshly brewed green tea, no sugar, was my initial thought. Brine again, more white flowers, guavas, sugar cane sap oozing out after you chop a stalk down. Overall the lightness was somewhat illusory, because the rum displayed a good warmth and firm delicacy (if that isn’t a contradiction in terms), and demonstrated why there remains no “perfect” rum strength – a higher proof would have shredded this Fijian, while 44% was exactly right. In fact, it showed off a lot of characteristics of an agricole, more than a rum coming from molasses (it was confirmed that it did indeed derive from molasses, not cane juice). The finish was short, smooth,heated and elegant, but nothing really extra was added to the party over and beyond what I noted above…perhaps some faint vanilla, gherkins in weak vinegar, swank, not much else. 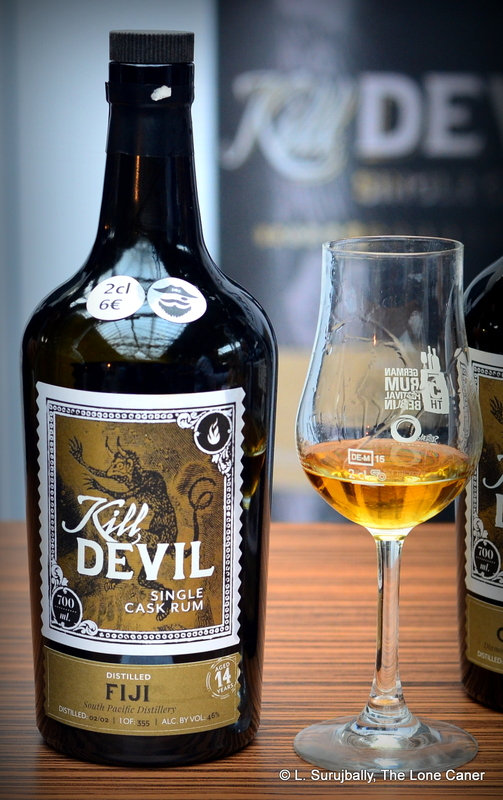 I thought it was a decent rum, made by a company which knew what they was doing when they selected it, and you could sense the assembly was done well – the mouthfeel, for example, was excellent. Where it fell down for me was in the snarly disagreement between the individual sweet versus sour/salt components – they didn’t mesh well, and the wax and turpentine notes kept interrupting like annoyingly plastered gate-crashers at your daughter’s wedding. This is quite a bit better than the BBR 8 Year old I reviewed back in 2013, which had similar issues, just more of them, and there I attributed it less to terroire and more to insufficient ageing. Now, I’m not so sure – the clear and somewhat jagged profile may be characteristic of the area, and if so, we who love rums should try a few more before rushing to condemn and criticize – it’s not like there’s a historically huge sample set out there to compare with. Suffice to say, for the moment, this isn’t quite my cup of tea. It’s a technically well made rum whose individual components, delicious on their own, aren’t quite cohering the way they should to make the experience a sublime one. Or even a better one. Florent advised me the barrel was bought through a broker, and no sugar was added.